Google organized travel data and captures more revenue than the industry leader. Google is now organizing multifamily apartments data. Google is Starting to Organize Multifamily Data. That Should Scare the ILSes. As Google absorbs and organizes information in different industries, it eats into the revenues of those ecosystems. It has done this in the past. It absorbed and organized the data for the restaurant industry. Victim: Yelp. It absorbed and organized the data for the hotel industry. Victims: Expedia & Priceline. Now, Google is absorbing and organizing the data for the multifamily industry. Multifamily ILSes (Internet Listing Services) such as Apartments.com and Rent.com are squarely in their cross-hairs. Fewer leads from ILSes, more leads from Google. How are you preparing for this change? In this 5-part post on Apartment Knowledge Graphs, we will give you the tools to understand and prepare for it. Let’s start with a little trip down memory lane. First, as promised in its vision, Google organized data for the Hotel industry. Second, it made the data useful by ensuring users got all the answers they needed without leaving Google Maps or Google Search Pages. Third, the attached ads to those search results started cutting into the online travel agencies’ (OTA) revenues. In 2016, the revenues of the largest player in the OTA industry, “Priceline Group” (now called “Booking Holdings”), was $10.7 billion. Google’s travel division has caught up fast and is estimated to have revenues of $14 billion in 2017. Want help creating a Knowledge Graph to grab more Google traffic? Get in touch! How does Google organize industry data? And, how does it shift revenues from the industry ecosystem to itself? The answer is in the deceptively simple, but awesomely powerful Knowledge Graph. Let’s look at the Hotel and the Apartment Knowledge Graph to unpack this technology. 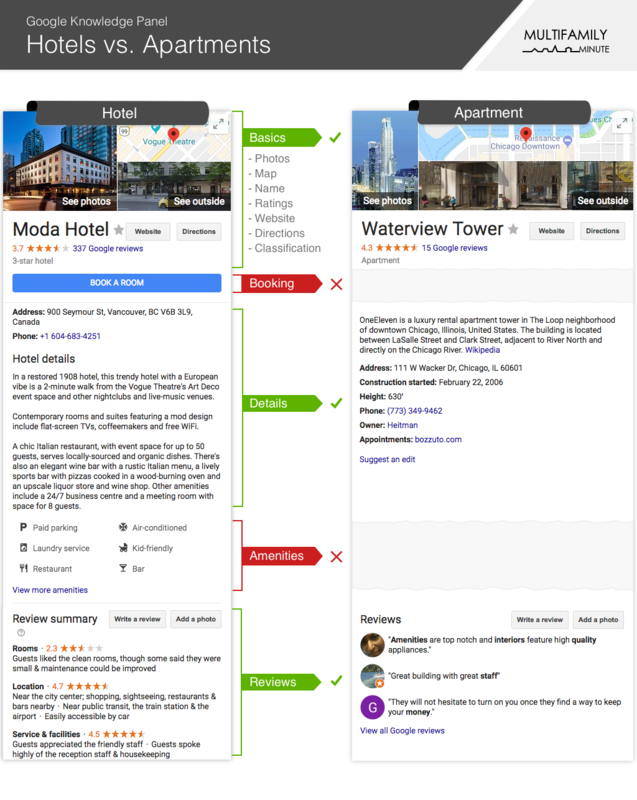 What did it take to organize the Hotel Knowledge Graph? And, then, Google linked all of the above to create the knowledge graph for a single hotel. Why is the Knowledge Graph so much more powerful than other search results? First, the knowledge graph is not a link to other sites. Third, it has a built-in call-to-action that allows the user to initiate a transaction from Google. In this case, booking a room. As a result, users are able to do all their research and make their decisions without leaving Google. In contrast, the online travel agency (OTA) is left out of the loop. At best, it is left to make the actual reservation. At worst, the reservation is made directly on the hotel’s site itself. Pretty close to the Hotel Knowledge Graph, right? 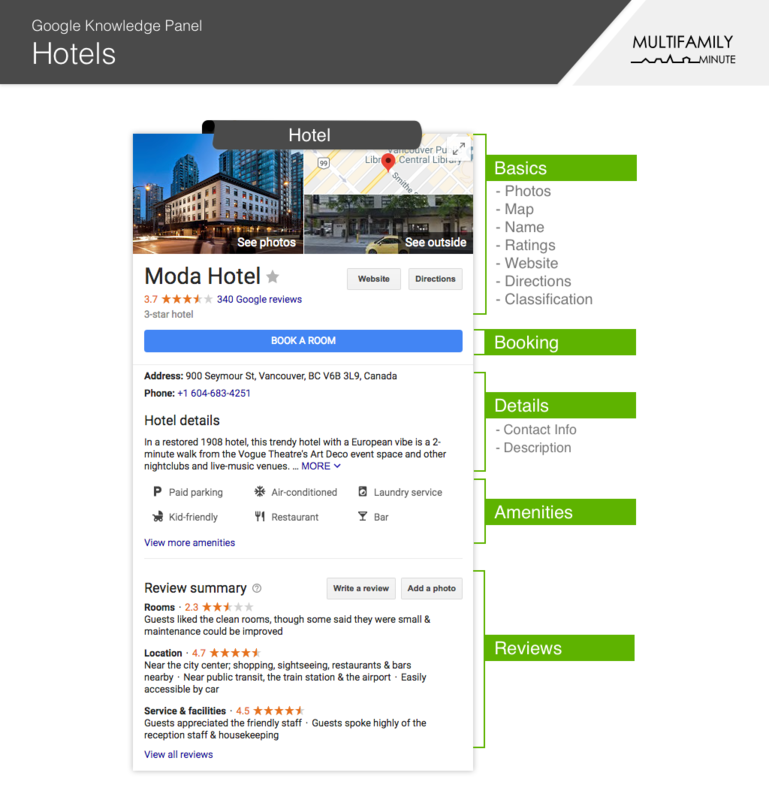 Google’s knowledge graph for hotels supports all of the above functions. But, Google’s knowledge graph for apartments is not that far behind. It can do the first but not the second and third items. What’s Similar Between the Hotels & Apartments Knowledge Graphs? Both contain the basics, such as photos, links to maps, links to websites, etc. Hotel and Apartment details are found in both panels. Though, it seems a lot more thought has gone into the hotel’s description. Since reviews are a part of Google’s platform, there is hardly any difference here. What’s Different Between the Hotel and Apartments Knowledge Graphs? However, it is only a matter of time before Google adds apartment amenities and floor plan pricing to their Knowledge Graph. Once they do that, expect a lot of ready-to-apply leads coming from Google. 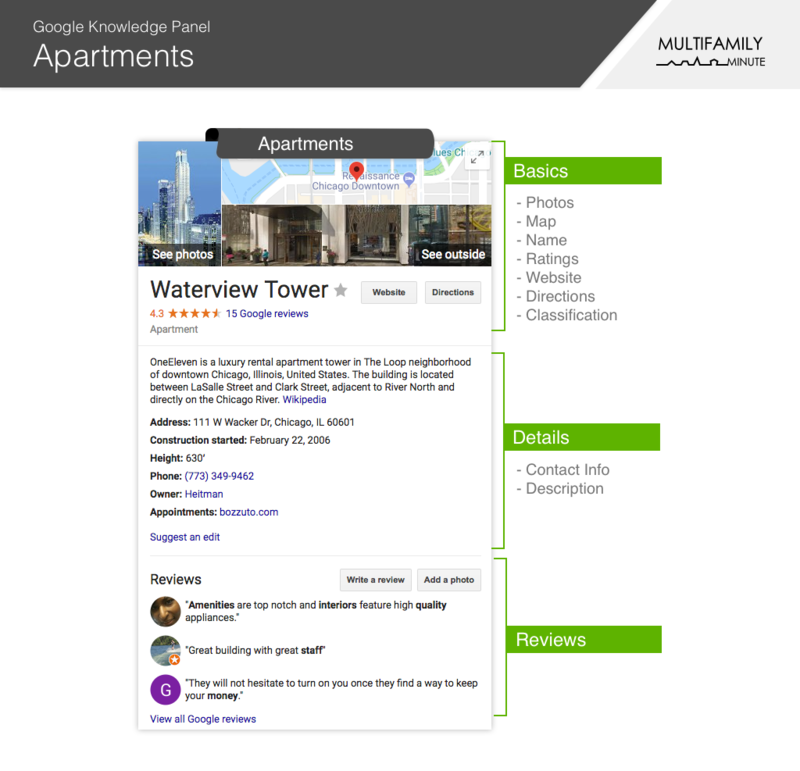 The Apartments Knowledge Graph is very similar to the Hotel Knowledge Graph. Above, we compared the two on a search page. Now, let’s compare them on Google Maps. A close look at the comparison shows there is a shift happening in the multifamily industry. Google Maps’ results for a Hotel and an apartment building are almost identical. But there is one vital difference: there is no pricing info for apartments. The story is the same for its list view. They are very similar except for pricing. 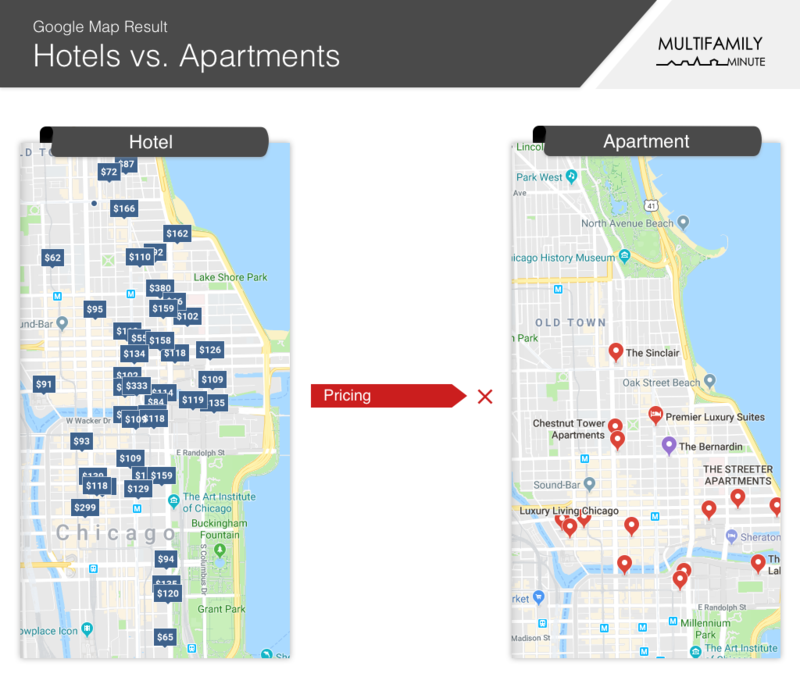 How about the result view for a single hotel vs. a single multifamily complex? There is no pricing on the apartment side. For a person searching for a hotel, its amenities are key in the decision-making process. 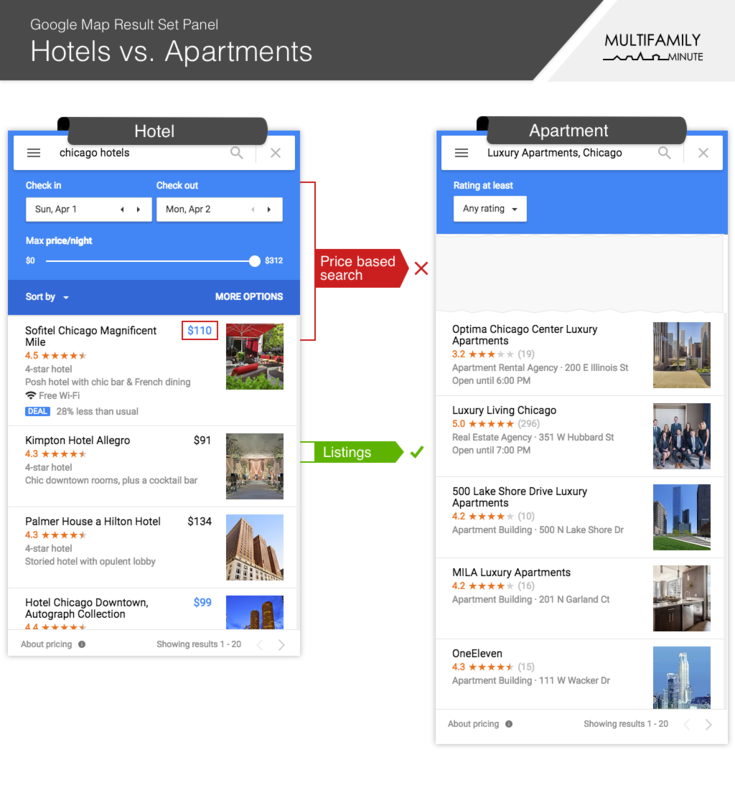 While the Hotel Knowledge Graph has amenities, the Apartments Knowledge Graph does not. When a prospect is ready to act, it is important that they have the option to book a tour online, just as they are able to book a hotel room with Google. …and, it wraps up its Apartments Knowledge Graph. That’s it! Once they finally do that, consider it GAME OVER! The Multifamily ILS is the next domino to fall. So, how can Property Management Companies take advantage of Apartment Knowledge Graphs? Read on! 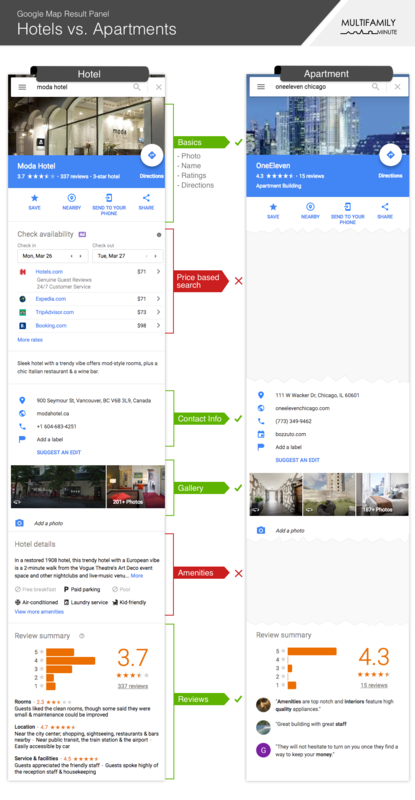 So far we have covered how Google will take over the Multifamily ILSes’ business with their Apartments Knowledge Graph. But, property management companies (PMC) can get more leads from Google by building their Apartments Knowledge Graph. 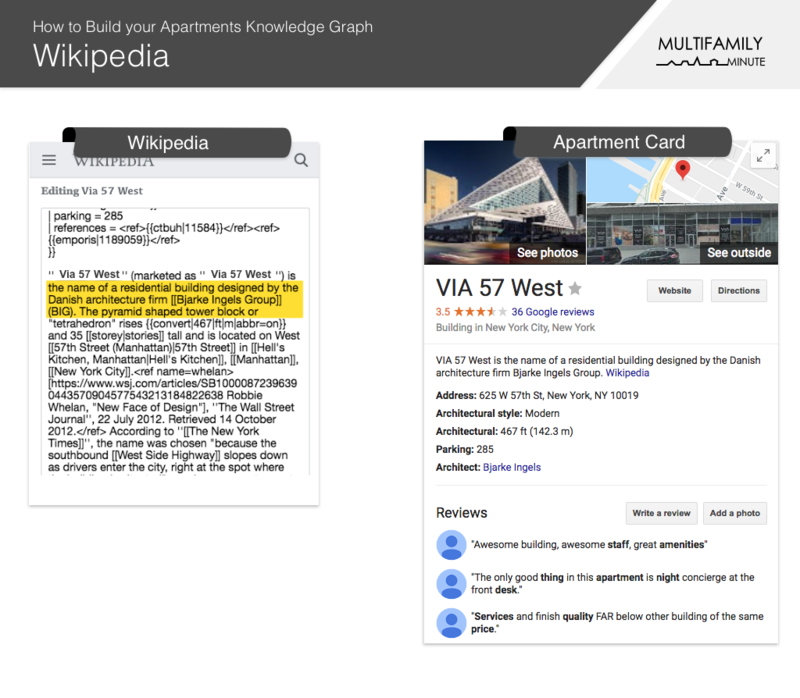 How Can a PMC Build Its Apartments Knowledge Graph? Let’s dive into how you can use each source to position your apartment well with Google’s users. Next, write a Wikipedia article about your property. Google loves to use Wikipedia as a resource and will use it to enhance your knowledge graph. 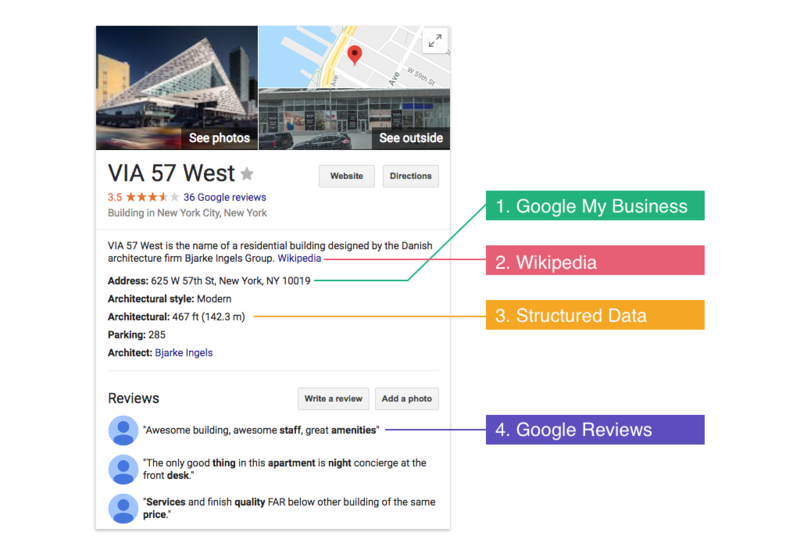 Google uses structured data to assemble its Knowledge Graphs. The following steps are slightly technical, but not crazily so. In general, web developers (like Hy.ly) should provide this functionality out-of-the-box, so you don’t have to do this. Finally, we get to the Reviews section of the Apartments Knowledge Graph. This has been covered in many other places, so we will not get into this in detail. 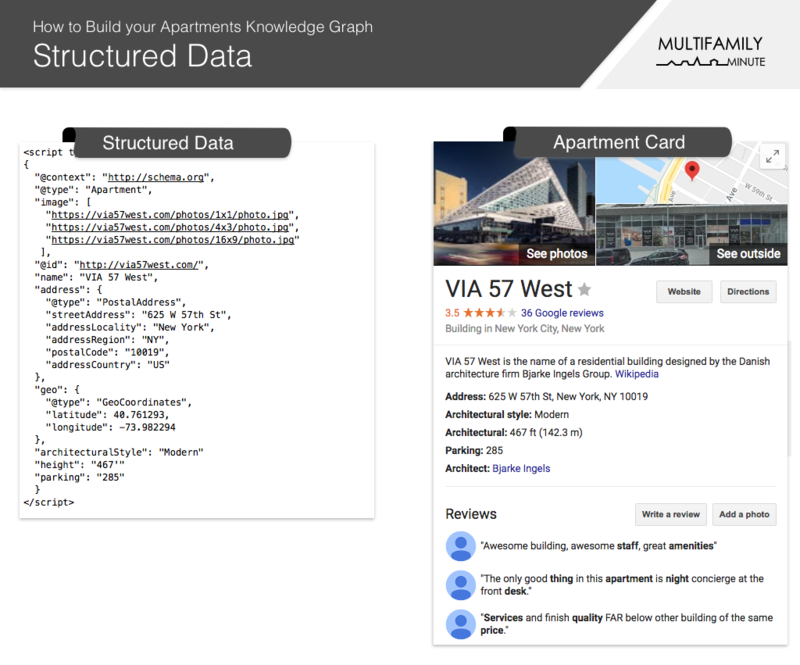 Is an Apartments Knowledge Graph in your Future? As Google takes over the multifamily industry, PMCs can get ahead of their competition. If PMCs can help complete Google’s knowledge graph for their apartment communities, Google will help them get more qualified leads. If that happens, Google may completely overtake the ILSes. Did you find this article helpful? Get more illustrated technology explainers for MFEs by signing up for Multifamily Minute!